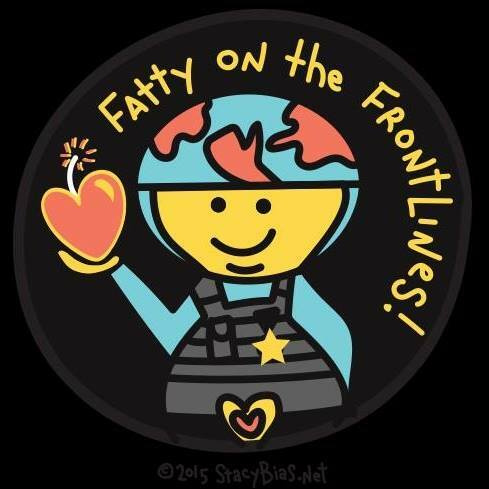 Tonight I want to talk about the the very complicated feelings that attending and participating in the New Zealand Fat Studies: Identity, Agency and Embodiment (FSNZ16) conference last month. As a fat activist and fat woman, there is no clinical distance for me for this topic, it’s not an abstract concept that I can divorce from my lived experience. So attending and participating in a conference like this is never going to be just another part of my job, or an academic learning experience for me. Talking about fat bodies and fat people’s lives is talking about me, and people like me. Which is why I appreciated that the theme of the conference was “Identity, Agency and Embodiment”. Because no matter how much people attempt to be theoretical about fat bodies, it doesn’t work that way. Fat bodies belong to fat people, and this is our lives that are being discussed. So I expected this to be an emotional experience for me – previous fat studies conferences that I have attended have been, and my feelings about living in a fat body have only got more complex over the years. It is amazing to be able to listen to people who have spent as much time thinking about and exploring the topic of fatness that I have, if not considerably more. It’s a sad reality of fat activism that the dominant voices one hears are self proclaimed “experts” who have absolutely not one iota of qualification to speak on the topic. Everybody is a bloody expert on fat bodies. So many random nobodies you encounter feels the need to expound at length on your body and what it is like to live in a fat body, when the vast majority of them have never experienced life in a fat body. You can’t avoid it – everyone has an opinion on your body when you are fat – your family, colleagues, friends, random strangers. Plus how many “obesity” conferences happen around the world every week that do not invite a single fat person to speak on their own experiences? That’s not to say that I agree with all of the perspectives put forth at FSNZ16. I did feel some presentations missed some important points, and others challenged me to think differently about certain topics around fatness. Of course, there can be valid points amongst something I fundamentally disagree with, and when a group of academics and activists are looking at a topic through the lens of fat identity, agency and embodiment, there are always going to be lessons to take away from every presentation, even if generally one disagrees with them. But most of all, what I valued the most was the community. This was a room full of people whom I did not have to educate from scratch. This is almost unheard of for me – I spend the majority of my time engaging in Fat Activism 101, where I constantly have to justify the right of fat people to have a life of dignity and respect – something I have been doing for almost 8 long, long years. I did not have to explain to any of the attendees the basic tenets of fat activism. We spoke a common language, and are approaching the topic from a similar direction. Not to mention, generally speaking, people engaging in fat studies are not looking to eradicate, cure or prevent fatness. They’re looking at what it means to live in a fat body, how society treats fat people and how we can maintain fat people’s rights. It’s not just within the actual conference either – the events around it, even the meals shared with the other participants are a refreshing change from every day life. Topics of conversation were not about dieting, or how virtuous or sinful anyone was for their bodies, health, fitness or eating habits. Do you know how often that happens to me in daily life, to be in a space where I’m not bombarded by those narrow topics? NEVER! I literally have to isolate myself from almost person I know to be in a space where we aren’t discussing a diet, or a fitness regime, or how “naughty” someone is for having a piece of cake. To be able to have a meal and talk about ANYTHING other than those topics is so refreshingly interesting. Fat studies scholars are fascinating people, because they don’t talk about diet, weight and exercise all the time! To be able to eat lunch and have general conversation about travel, or the different plants that grow in our home towns, or funny stories about what we did on the weekend, or our pets or a million other topics was so interesting! Not to mention that I could relax and eat a meal without feeling judged for every morsel that passed my lips. And we could talk about food without judgement, discuss things we had tasted and what the food was like in comparison to that in our hometowns. I don’t think I’ve ever been to dinners as interesting and relaxing as the two nights I went out to dinner with my fellow fat studies scholars. We laughed, we discussed politics, we talked about people we knew in common, we laughed, we talked about and made inside jokes about fatness that weren’t tutted over or turned into awkward silences. I wish I could be around these fascinating people all the time. There is nothing quite so comforting as a community that you feel you belong to. As a fat woman, I’ve been excluded from so much of society by people who judge me as inferior to them simply because of the size and shape of my body. To be at an event where I felt both challenged/stimulated and included was incredibly powerful for me. I only wish that we all lived closer to one another so that we could do it more often.